Change in Meeting Format and Presentation! There are many individuals who would benefit from the resources that HLAA Madison provides but who are either unable to attend meetings or are unaware of HLAA in general. In attempt to reach out to these individuals, the HLAA Madison Board has decided to hold regular meetings at different locations throughout the area. These locations may be retirement centers, VFW's, Senior Centers, and others. A single presentation format will be followed and will be focused on providing basic information regarding hearing, assistive devices, and resources. These meetings will be held every third month with the first Outreach Meeting being held in February and the next one in June. All other meetings will be held at our usual meeting place, First Congregational Church. The National Office of HLAA recently announced that hearing loss was recently included in the CDC report on disabilities. This is important because without good documentation of the prevalence of hearing loss, there is little incentive to improve services. You can read the announcement below or here on the National HLAA website. On August 17, the CDC came out with their 2018 report, “The Prevalence of Disabilities and Health Care Access by Disability and Status Type among Adults – United States, 2016.” This time, hearing loss was included. In all there were six disabilities people were asked about. Hearing loss was added to the original five: cognition, independent living, mobility, self-care, and vision. The CDC said by adding the sixth disability (hearing loss) to the list the number of adults ages 18 and above who have a disability jumped from one in five to one in four.The study authors report this as a key finding. These studies are important because they help shape public policy and services concerning people with disabilities. When you read the report, keep in mind the CDC only asked about being “deaf or having a serious difficulty hearing.” Therefore, their findings might seem low to you, but they didn’t take into account all levels of hearing loss. People also had to self-report via a telephone survey. However, their conclusions align with other scientific surveys. Thank you, CDC, for adding hearing loss to your list! Madison HLAA-Chapter sponsored an outing to a Mallards Baseball game. The following article was written by Jerry Lapidakis, member of the HLAA-Madison Board, and was published in the HLAA National Blog. Friday, July 13th was a dark and stormy night, not fit for man nor beast. Well, it didn’t start out that way. 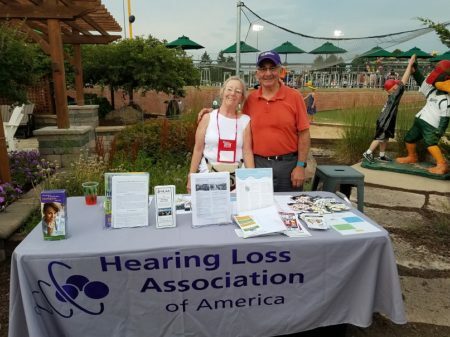 The Madison Chapter’s social and hearing awareness night at the Madison Mallards minor league game was a success as far as our goal of informing the public about hearing loss went. We set up our resource table inside the gate and handed out hearing loss literature to the fans as they came in. We distributed information about HLAA, our chapter, hearing aids, and hearing loops. We offered those with hearing aids a pack of hearing aid batteries donated by Rayovac. “Super Hearing Man”, Emil Quast, who is also Wisconsin’s state chapter coordinator, worked the crowd as they came in. We passed out lots of literature and batteries. Peggy Troller and Jack Spear handed out information along with Linda Conlon and I. With members of HLAA Madison working together, all who entered the ballpark had contact with us. There was no excuse for someone with hearing aids not to get some free batteries and information about HLAA. It was all going fine. We took our seats for the game. 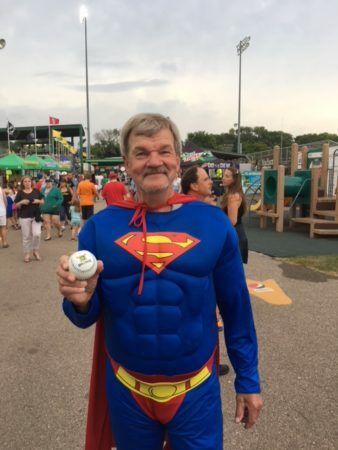 Super Hearing Man threw out the first pitch and the game began. We did notice those menacing, dark clouds coming in from the west but thought maybe they would pass us by. In the second inning, the rains came. Boy, did they come. Heavy, driving rain and lightning got us all soaked. Eventually, the Mallards called the game. At first, we perched under the roof of the stands but even there the wind drove the rain to our protective perches. The smart ones, who anticipated the coming storm, had umbrellas and rain gear. The rest of us did not and continued to get soaked as we made our way to the parking lot to leave for home. The Mallards have graciously offered us a “do-over” of the event. We can reschedule for a later game this season, offer individuals vouchers for a future game, or receive a credit towards a game next year. We are currently considering the options. The game was both a member social and a wonderful chance to interact with the public about hearing loss. The chapter sold 29 tickets to the event in advance. We were able to talk to many people and, hopefully, raise awareness in the general population. We accomplished those goals, thanks to the energy and support of chapter members. Hey, a little rain isn’t going to stop us from getting out the word about hearing loss and HLAA. And it certainly didn’t stop us from having some fun doing it. We definitely plan to do this again, only without the rain storm! Peggy Troller has been a nurse for 34 years – and she likes to make work fun. “I would say I am the silly one on the unit. I am always for keeping things lively,” said Troller. Natalie Eberle and Neethi Magar from the Madison Chapter, Colleen Van Rooy from Appleton, and Jim Rau from Iron River attended the Madison chapter meeting on March 28 via live streaming using Zoom – complete with captioning!!!! This was our first “broadcast” and there will be more. The Madison Chapter has two Roger Pens for HLAA members to try. The pen is a wireless microphone that allows you to understand in noise and over distance. It reduces background noise and keeps you connected in virtually every listening situation. It is fully automatic. The Roger comes with the pen, receiver, charger, cords and headset. HLAA chapters were given these pens to have members evaluate them. So, you must sign an application and agree to complete an online survey of your impressions of the pen. Please contact Natlalile Eberleor Jerry Lapidakis if your are interested in borrowing the pens or want to learn more.